The Indigo Blue Circle Temple Jar has a truly elegant shape that is suitable for contemporary modern decors as well as more colonial or victorian traditional settings. 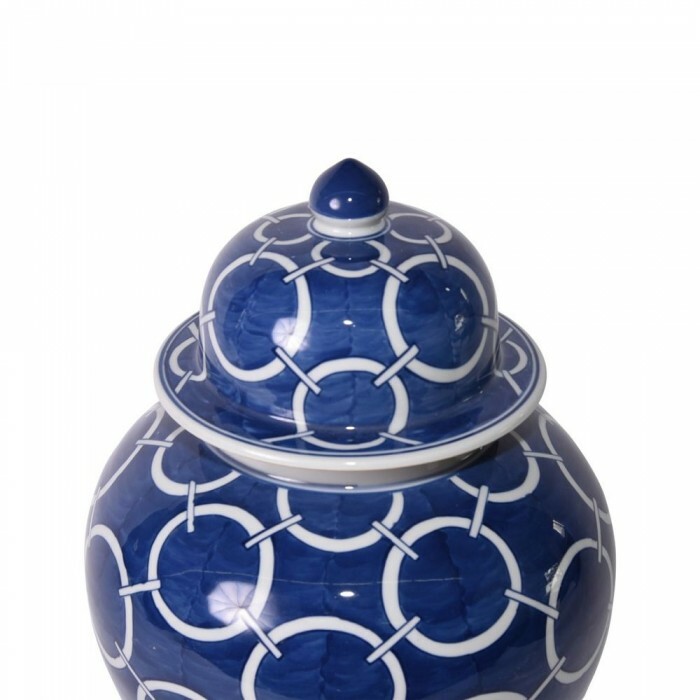 Whether elaborately decorated or finished in a single color glaze, the shape suggests a degree of seriousness. A single temple jar has great impact when placed in a home's entryway, or as a dining table centerpiece filled with your favorite fresh bouquet of flowers. For a more regal look, leave the "General's Hat" (lid) on. Placing them on pedestals or mantles will add drama to a room. Temple jars are simply a great decorator’s accent piece because it casts an air of stateliness and uplifts the significance of the objects which surround it. 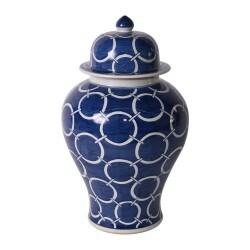 Scale is important when decorating with just one temple jar: the bigger the piece, the more significant its presence.